Streams of the River: Has the Holy Spirit Got You? Pentecost is when we celebrate the coming of the Holy Spirit in power and love upon the Church, the culmination of the Great Fifty Days of Easter. However, if all we do is have a church service with beautiful vestments, sumptuous ceremonial and stunning music that helps us remember an event that took place nearly two thousand years ago, we have forgotten the purpose of our celebration. The whole point of today is for us to come into this holy place with a real intensity of desire, desperate for a fresh outpouring of the Holy Spirit in our lives in order to be more effective witnesses to Jesus. “You shall receive power when the Holy Spirit comes upon you, and you shall be my witnesses . . .” (Acts 1:8). You know the story. People from many different countries heard the praises of God in their own languages, and Peter (who had once been so timid) preached to the crowd, resulting in three thousand people being converted to Jesus. They were baptized and became foundation members of the Jerusalem Church, a real community of love whose way of life was itself a powerful sign of God’s presence, and a proof that Jesus is alive. Read right through Acts 2 and you will see how this community met for worship, learned the Faith from the apostles, grew in love and fellowship, and supported each another in the sharing of their daily lives. As the apostles, filled with the Holy Spirit, preached the Gospel further afield, they planted more and more church communities that surged with the life and love of Jesus. 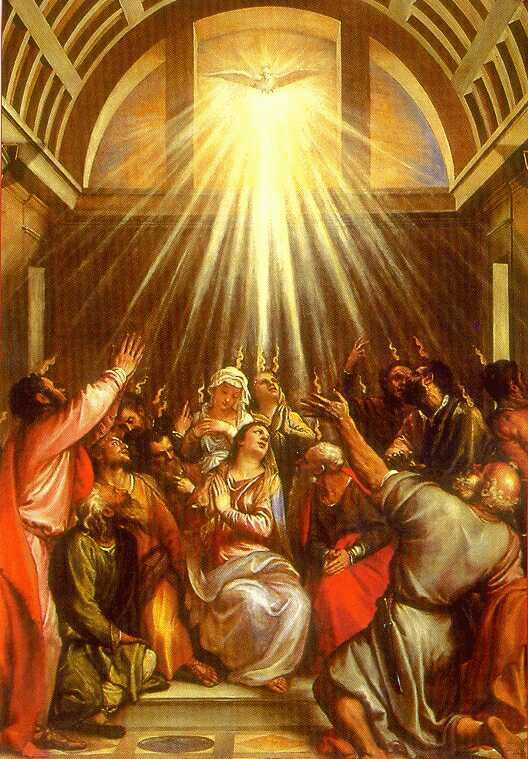 They taught that the outpouring of the Spirit received at Pentecost was not just for them, or for those who responded to Jesus on that day, but for all Christians of all time. Furthermore - as we heard in our second reading - they taught that the Holy Spirit gives gifts to each of us for the common good, for building up the community, and for the nurturing of our unity in Christ. If we ever needed a fresh outpouring of the Holy Spirit it is now. It was the Belgian Cardinal Leon Josef Suenens who said that the important question is not, “Have you got the Spirit?” If we are baptised and confirmed, the answer is obviously “yes.” The real question, according to Suenens, is, “Has the Spirit got you?” It’s no good just resting on the assurance that we have been baptised and confirmed, or even that we have had some past experience of conversion or infilling of the Holy Spirit. What matters is that we are open to the Holy Spirit’s love and power, his presence and prompting NOW . . . that we are allowing him to change us a little more each day into the image and likeness of Jesus. Further, that we are taking our place in the community of our parish so as to share our gifts and encourage others in their life and ministry, and that we are reaching out in love day by day to those around us who do not yet believe.